When I was a child in Catholic school, we learned about missionaries from Europe who came to North America in the 1600s to work with the Native Americans. The native people called them “Blackrobes” because of their religious habit. They were members of the Society of Jesus, the Jesuits. There were exciting stories which sounded like the “Wild West” but were situated much nearer to where I lived in Massachusetts. We learned about a place in upstate New York called Auriesville – about 30 miles from Albany where St. Isaac Jogues and his companions ministered to the Iroquois nation and were protected by a peace treaty. Unfortunately Jogues was killed at the hands of a Mohawk war party, but his companions continued to serve the five nations and it was there that a young native maiden named Kateri Tekakwitha came under their tutelage and converted to Christianity. Because she was Christian she was always in danger from her own people, who treated her as a slave. Eventually, on the advice of one of the priests, she stole away and walked 200 miles to Canada, where she joined a Christian Indian village near Montreal. She dedicated her life to prayer and good works and dreamed of starting a religious community with two friends but since at the time there were no such communities she accepted that she was rather to live an “ordinary life” which for her involved constant prayer and fasting for the conversion of her nation. When my family moved to upstate New York one of our day trips was to Auriesville where the stories came even more alive for me and after which I always kept Kateri close in my heart. In 2012, Catholics and Native Americans in New York State were blessed to have two women canonized as saints of the Church – one a religious Sister from Utica, NY – Mother Marianne Cope, often referred to as Mother Marianne of Molokai for her work as a missionary of her community in Hawaii working with the lepers (victims of Hansen’s disease) on the island of Molokai. She was also a great light in her native place as she was instrumental in founding two hospitals (in Utica and Syracuse, NY) and lived until 1918 so memories of her are alive in that community today. 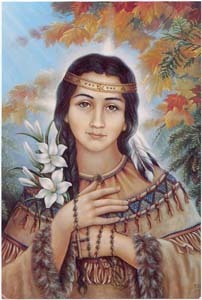 The other new saint is Kateri Tekakwitha, the first Native American recognized as a saint of the Church. Today I plan to keep both of these women close in thought, grateful for strong women of faith who, as women “ahead of their times” contributed to the Christian story and heritage, women to look up to as examples of courage and willingness. I will also remember all our native brothers and sisters whose spirituality is so rich and from whom I have learned to reverence all creation. Mother (Saint) Marianne was a fountain of endless energy and spiritual encouragement to those around her. She is my inspiration and a real presence to those who love her.